When I was working the night shift a few years ago, one of the ways that I killed time was looking for book lots on ebay and sometimes buying them. Its amazing how buy clicky your finger gets at 3am when there isn’t much going on and you are struggling to stay away. One of the best deals I found online was buy 10lbs of randomly selected books (you could pick the genres) for $15. And if you bought 30lbs, you got an extra 10lbs for free (yeah, I totally got suckers into buying the 30). I ended up selected romance – and a mix of contemporary, historical, pnr and other stuff for the box. When the box showed up wow, it was like a treasure trove and I immediately dug in. 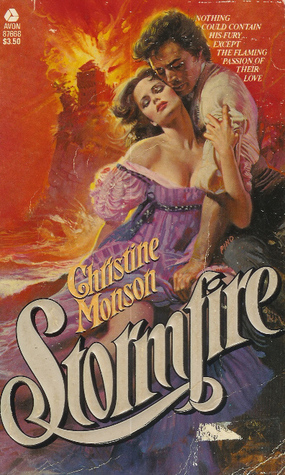 There was at least one awesome find in the box – Stormfire, written by Christine Monson. This book has been talked about on romance message boards for years – it was released in the height of the bodice ripper genre and is definitely either a love it or hate it book. What’s more, if you try to buy the book nowadays, you normally can’t find it cheaper than about $60, because only a limited print run was done, and it has not been re-released since and likely won’t. So the fact that I got it in a box that I probably only paid on average about $2 per book was pretty awesome. Oh yeah, and I feel in the love it category. But it wasn’t an easy read – it was violent, it was disturbing and by all rights, I should have hated it, but the writing was extremely compelling and sucked me in. Ha! That sounds like my own experience with the infamous “Stormfire”. I was searching for this book for so long and finally one day, I was online searching for something else, and spotted it for dirt cheap. As you mentioned, the book is extremely expensive since it is out of print. Though I didn’t love the book, it sits on my book shelf with many books in it to mark my favorite lines.